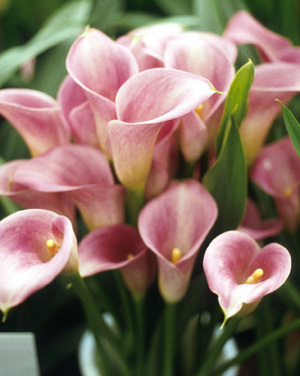 Home|Floral Library|Miniature Calla Lily – Zantedeschia rehmannii, Z. spp. Many colored cultivars being developed in New Zealand; crosses of Z. elliotiana, Z. rehmannii and Z. albomaculata. Sometimes the foliage of Z. aethiopica is used in the floral industry as a cut green. If used as a green, do not use flower food as leaf yellowing is promoted but do try treating with gibberellin (3 or 4+7) either as a spray or dip as the green leaf color can be maintained. It is unknown if these same results would be obtained by Z. rehmannii and other species but the gibberellin treatment is worth trying.